PVC electrical tape, red, 15mm x 10m, HelaTape Flex 15, HellermannTyton, 710-00101 FLEX 15 is a multi-purpose highly flexible, vinyl electrical tape with 10m lenght and 15mm width which provides electrical insulation, protection, fixing, maintenance and color coding for all wires and cables in circuits up to 1kV. Good resistance to abrasion, sunlight, moisture, chemicals and varying weather conditions. Manufacturer Code: 710-00101. PVC electrical tape, HELATAPE FLEX 15, width 15mm x length 10m, brown FLEX 15 insulation tape you ensure electrical insulation, protection, fixing, maintenance and color coding for all wires and cables in circuits up to 1 kV. Manufacturer Code: 710-00107. brown tape. PVC electrical tape, HELATAPE FLEX 15, width 15MM X length 10M, white FLEX 15 insulation tape provides electrical insulation, protection, fixing, maintenance and color coding for all wires and cables in circuits up to 1 kV. Manufacturer Code: 710-00105. White tape. PVC electrical tape HELATAPE FLEX 15, width 15MM X length 10M, yellow FLEX 15 electrical insulation tape provides electrical insulation, protection, fixing, maintenance and color coding for all wires and cables in circuits up to 1 kV. Manufacturer Code: 710-00102. PVC electrical tape, HELATAPE FLEX 15, 15MM X 10M, green FLEX 15 electrical tape provides electrical insulation, protection, fixing, maintenance and color coding for all wires and cables in circuits up to 1 kV. Manufacturer Code: 710-00103. PVC electrical tape, HELATAPE FLEX 15, 15mm X 10m, blue FLEX 15 insulation tape provides electrical insulation, protection, fixing, maintenance and color coding for all wires and cables in circuits up to 1 kV. Manufacturer Code: 710-00100. PVC electrical tape, HELATAPE FLEX 15, width 15mm x length 10m, purple FLEX 15 insulation tape provides electrical insulation, protection, fixing, maintenance and color coding for all wires and cables in circuits up to 1 kV. Manufacturer Code: 710-00109. Purple tape. PVC electrical tape, HELATAPE FLEX 15, width 15mm x length 10m, orange FLEX 15 insulation tape for electrical insulation, protection, fixing, maintenance and color coding for all wires and cables in circuits up to 1 kV. Manufacturer Code: 710-00110. PVC electrical tape HTAPE-FLEX15-15x10-PVC-GY, 15mm X 10m, gray FLEX 15 insulation tape provides electrical insulation, protection, fixing, maintenance and color coding for all wires and cables in circuits up to 1 kV. Manufacturer Code: 710-00108. PVC electrical tape, HELATAPE FLEX 15, width 25mm x length 25m, black FLEX 15 electrical insulation tape provides electrical insulation, protection, fixing, maintenance and color coding for all wires and cables up to 1 kV. Manufacturer Code: 710-00137. Black PVC tape. PVC electrical tape, HELATAPE FLEX 15, width 25mm x length 25m, blue FLEX 15 electrical insulation tape provides electrical insulation, protection, fixing, maintenance and color coding for all wires and cables in circuits up to 1 kV. Manufacturer Code: 710-00133. Blue PVC tape. 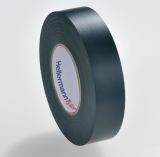 PVC electrical tape HELATAPE FLEX 15, width 25mm x length 25m, brown FLEX 15 electrical insulation tape ensures electrical insulation, protection, fixing, maintenance and color coding for all wires and cables in circuits up to 1 kV. Manufacturer Code: 710-00140. Brown tape. PVC electrical tape HELATAPE FLEX 15, width 25mm x length 25m, yellow FLEX 15 electrical insulation tape provides electrical insulation, protection, fixing, maintenance and color coding for all wires and cables in circuits up to 1 kV. Manufacturer Code: 710-00135. Yellow tape. PVC electrical tape, HELATAPE FLEX 18, width 19mm x length 20m, black FLEX 18 insulation tape provides electrical insulation, protection, fixing, maintenance and color coding for all wires and cables in circuits up to 1 kV. Manufacturer Code: 710-00201. Black tape. PVC electrical tape, HELATAPE FLEX 18, width 19mm x length 20m, blue FLEX 18 insulation tape provides electrical insulation, protection, fixing, maintenance and color coding for all wires and cables in circuits up to 1 kV. Manufacturer Code: 710-00200. Blue color. PVC insulating tape, HELATAPE FLEX 1000+, width 19mm x length 20m, brown The FLEX 1000+ electrical insulation tape provides protection, fixing, maintenance and color coding for wires and cables in circuits up to 1 kV. Manufacturer Code: 710-10608. Brown tape. PVC electrical tape HELATAPE FLEX 1000+, width 19mm x length 20m, red FLEX 1000+ insulation tape provides electrical insulation, protection, fixing, maintenance and color coding for all wires and cables in circuits up to 1 kV. Manufacturer Code: 710-10604. Red tape. PVC insulation tape, HTAPE-FLEX15YE, 19mm x 20m, green-yellow FLEX 15 electrical insulation tape provides electrical insulation, protection, fixing, maintenance and color coding for all wires and cables in circuits up to 1 kV. Manufacturer Code: 710-00157.